Bursting with fiery flavor that's formulated for Cajun cuisine, Louisiana original hot sauce is the authentic, timeless recipe that your restaurant, bar, or steakhouse needs. Characteristic of true Cajun cooking, each cayenne pepper that goes into this one-of-a-kind sauce has been carefully selected and handpicked for the truest possible taste. Picking and blending the peppers with pungent vinegar and spices is an eighty year old tradition that continues to this day, ensuring that the utmost care goes into each bottle of hot sauce. 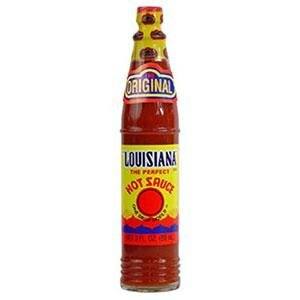 Maintaining a reputation for quality, this hot sauce prides itself in being the one and only Louisiana original. In fact, the famous red dot on the label distinguishes it from its imitators. Made of sun-ripened and fully-aged chile peppers, the cayenne flavor adds a burst of heat without overwhelming the natural flavors of the dish itself. From hot dogs and burgers to eggs and French fries, one dash of Louisiana original hot sauce is all you need to kick up the flavor of any entree or side dish. You can even rub this hot sauce on meats and fish or add it to marinades, dips, and dressings with some heat. A versatile condiment for an array of menu items, offer this 3 oz. bottle of hot sauce tableside so your customers can add as much as they want! Perfect amount of hot to spice up any dish. The bottle size is perfect for table use. I don't usually go for hot and spicy, but, I love this stuff -- especially on popcorn! five star all the way, there is nothing not to like this products. i love the flavors of this hot sauce and the size just adorable to place it on the table for customer to use. Perfect retail size! Great add-on for take out/delivery. Easy screw on lid to keep product fresh. Bottle shape pours out hot sauce at perfect speed. This Louisiana brand of hot sauce perfect for the professional kitchen, for a fraction of the price of some of the national brands. Perfect size for serving along side gumbo, or fresh raw oysters! Super affordable Louisiana hot sauce. This is the perfect size for home or your restaurant. You get 24 in a case, so it's a great value. Tastes good. Great hot sauce. We use it for so many applications. It's a great marinade and just by itself. These small bottles are great for guests use. Louisiana pepper sauce is the perfect way to add some kick to just about any meal. It isn’t too spicy, so it is a good choice for those that want a good pepper flavor without the pain. In my husbands words, Louisiana is "a sausage and biscuit savior." We like to eat hot sauce in our house and we always have Louisiana in our pantry. Louisiana makes a good hot sauce. It's got its own unique flavor that I find pleasant in Mexican dishes and sometimes just to eat a dash on its own. Louisiana hot sauce is a great condiment. It has a unique flavor as compared to Tabasco or sriracha and if you enjoy hot sauce this should be part of your collection. This 3 oz. bottle was perfect for my event. No one needed too much sauce, so I ended up with a lot left over. We still plan to use these in the near future. A unique condiments that will amaze our customers. They have different flavor so i order three cases of each. Will be a great condiments for restaurant.